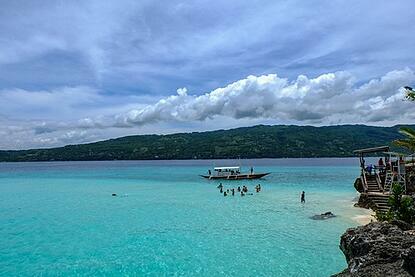 Cebu Island has an immediate charm drawing you in from the very first. Its white sands and coconut trees, waterfalls and babbling streams, not to mention its energetic nightlife, retail shopping, and dining all mix together perfectly to create a truly tropical holiday experience. 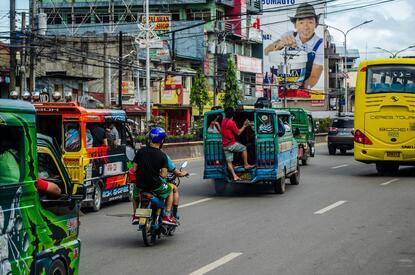 Tourism in Cebu is booming and draws nearly two-million foreign travelers each year. Among the favored areas are Cebu City on the eastern side, and from the northern tip of Cebu Island from Malapascua down the coast to Moalboal on the western side. Popular with divers and surface swimmers alike, this charming and organic resort situated on the island's south-west offers the perfect place to relax for a week or two. Snorkelers will love the swirling sardine tornadoes just beneath the sea's surface and a host of other marine life which form part of this exotic coral reef of endless wonders. Opportunities exist for experienced divers and beginners alike, and there are a host of diving schools to choose from if you're looking for training. 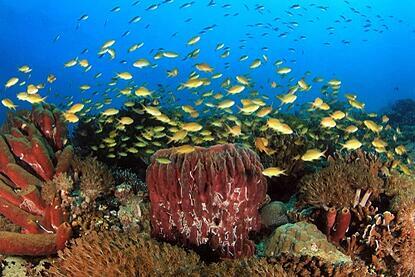 It truly is a divers paradise! 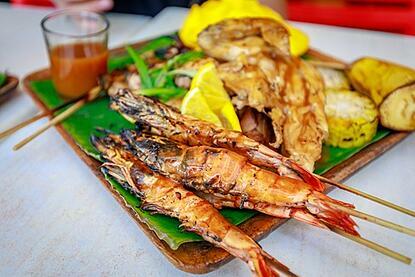 There are plenty of places to eat Filipino and other Asian delicacies, amongst which you'll find Indian, Indonesian, Korean, Japanese and just about anything else you may care to try, along with many familiar western favorites too. Many of the restaurants not only overlook the sea but actually stretch out over its edge thanks to the stilted structure of the buildings holding them over the water as you sit and take it all in. You'll undoubtedly be more than pleased with the reasonable prices, certainly by western standards, and a night out will regularly leave you change to spare. Sitting in one of these idyllically placed taverns is a great way to end the day with a cold San Miguel or cocktail overlooking the shimmering Tañon Strait and across to the sweeping mountains of Negros. The picture is one of perfection itself. 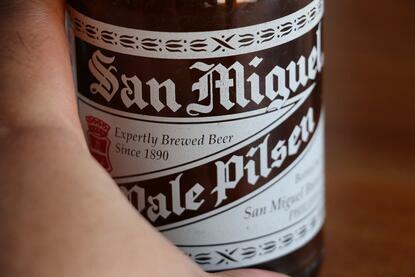 On the matter of the Filipino San Miguel, it was originally brewed in the Philippines and only much later introduced to Spain. There aren't many places where you can enjoy a quality beer at the price you can here, and with an unbelievable view to boot. Probably the best way to get about around Moalboal and to nearby districts is by hiring a scooter, which you can usually do between 300 and 500 pesos. Some of the back roads can be a little bumpy but nothing unmanageable when you take it steady, while the main roads themselves present no problems. Hiring a scooter opens up endless opportunities to explore hidden coves and alluring village tracks and any other delightful sight you may encounter, which are truly without number along the pleasant coastal roads. Of course, if scooters aren't your thing, then you can pay someone else to ferry you around by tricycle (similar to the tuk-tuks in Thailand) which are a cheap alternative and always readily on hand. Prices are very reasonable. As always, agree on the price first. 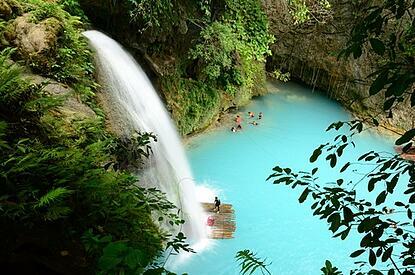 Just a 40-minute scooter or tricycle ride away from Moalboal are the beautiful Kawasan Falls. After parking your bike or being dropped off, take a 15 to 20-minute walk alongside the flowing crystal waters, which are a clear sign of the magnificent sight up ahead. When you reach the falls you'll be struck, not only by the cascading power of the tumbling waters, but the eye-catching turquoise pool it falls into, which paints a picture of tranquility itself. Safety jackets are available if you simply want to float and stare at the mesmerizing waters while cooling off. From Moalboal be sure to take a not too distant ride to Oslob. If riding out from Cebu, be sure to take the yellow bus to Bato then swap for the short ride into Oslob. Take the bus ride in the daytime if possible. The scenery is beautiful, whether looking to the right and out across the sea with its hypnotic crystalline water lapping the shore, or to the left side with its lush hills and palm trees. The ride is every bit a pleasure. Don't be put off if when you get on the bus if you have to stand, as the chances are people will be getting off and vacating at various stops along the way and you'll soon find a seat. 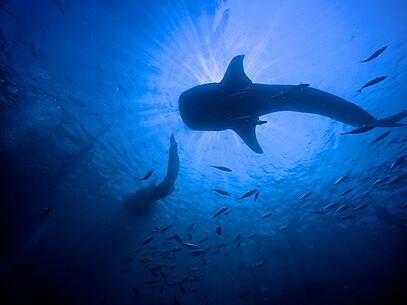 It's usually best to get to the whale shark area around 6 a.m., as crowds gather quickly. You may find you have to wait one or even two hours before getting in the water, but make no mistake, the wait will be worth it. A simple and traditional canoe boat with sturdy stabilizers will ferry you the short distance to where the whale sharks swim. The one thousand peso fee equips you with snorkeling gear and a life jacket, which is all you need to enjoy what may fairly be referred to as a once in a lifetime experience. Just a peek beneath the surface reveals an awe-inspiring vista, as these tremendous beasts of the sea glide by within metres. It goes without saying that they are harmless and feed off plankton, so your mind can be perfectly at rest as they swim nearby. The advice is to keep 4 metres away and do not touch them, a precaution in place to protect the thin protective membrane that covers their skin as opposed to aggravating them in some way. They really are gentle giants. Bring or rent an underwater camera if you want to fully capture the experience, or use a transparent waterproof cover and film the experience from your Smartphone. Whether you choose to take pictures or not, the awe-inspiring images will be indelibly impressed upon your mind for all time. 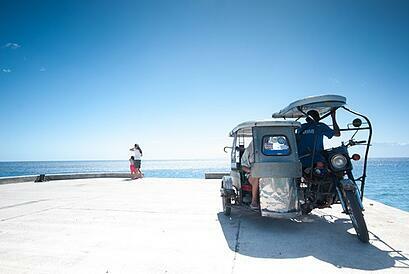 This is just a small itinerary when compared to all the gems Cebu has to offer. But even if you only get to see these few sights in Moalboal and Oslob, and some stunning places of natural beauty in between, you can be sure that you will sincerely promise yourself, you'll be back for more.